Okay, as a guy, I'm not exactly up on girl's fashion trends, but I have to admit that when I opened up this site to take a look at this week's BESTeam feature for our blog? My sister was peeking over my shoulder and she loved these. She loved them so much that I had to remind her that she has to pay me her part of May's rent before she can buy some. And, even I have to admit... they're very cute. As a twin to a very femme sister, I've been wrangled into a lot of things most guys don't learn. Like... how to french braid hair, or arrange a french knot or ballet bun. And I have to admit that these little pins would look great for use with those kind of hair styles to add a little color or flair to the look. The shop where these are found is Poppy Luxe Designs and is ran by Kimberly. 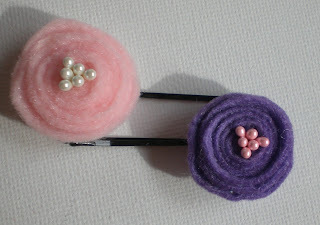 Her shop offers both these little hair pin creations as well as magnets and some decoupage designs as well. She has a frame over there that I think is really cool with a bird on a branch scrolled along the bottom. To check out these items and more, YOU CAN CLICK ON THE PICTURE ABOVE TO VISIT PoppyLuxeDesigns' SHOP ON ETSY AND TAKE A LOOK AROUND OR, IF YOU PREFER, CLICK RIGHT HERE. I can see why she loved them! SO CUTE and perfect for every age. Fun to have a post from your brother; always good to have a guys point of view once in a while. Thanks Leal for such a great post! It's nice to hear good things especially from a guy! love the personal touch, and you are a very good brother! Great guest post, bro! Wish my brother could fix my hair for me or write a blog post. Lucky sis! Thank goodness for commenting, because I totally missed the "brother" part in the opening sentence. Great feature of our fellow BESTeam member Big/Little Bro! Oh those pins are so cute!